It's been almost a month since we've moved 2,411 miles from the state of Michigan to the state of Washington. Life has been chaotic to say the least. In fact we went Southeast (Athens, OH) before going Northwest for my niece's wedding the week we moved. 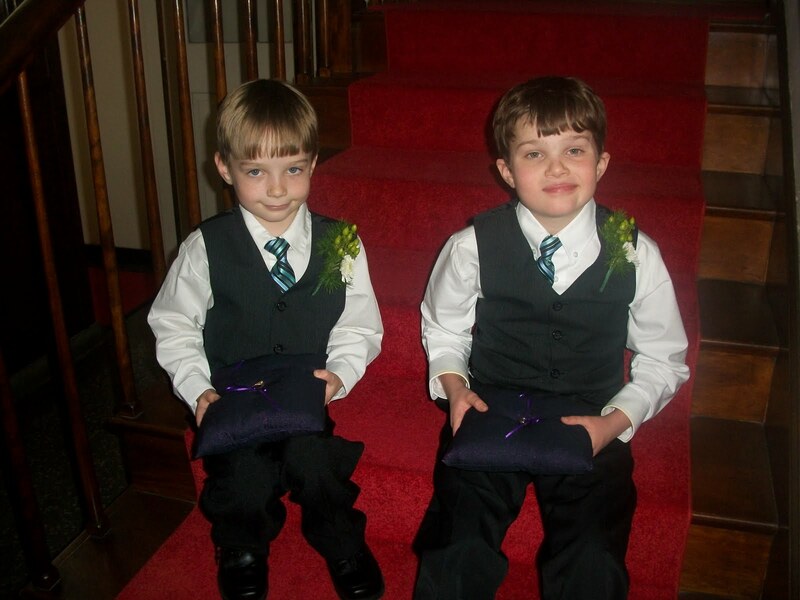 Both of my boys were ring bearers in the wedding and did a great job. They also did a wonderful job on their first flight although C1 had some trouble behaving in the three airports we were in. The moving sidewalks and the escalators were too attractive to him. He just wanted to do his own thing when we had specific places to go. Life is getting back to normal now although we still have some boxes sitting around and are expecting my husband's parents on Monday for an extended stay. All in all, it's nice to get back in our own beds after sleeping in sleeping bags for a week in the house we are renting. It took a seven days for our stuff to catch up with us via a moving company. The day our stuff came was the same day the two boys started school. So yes, that day was especially crazy. So yes, so far all is going well in terms of school. C2 is doing beautifully as expected. C1, according to his two teachers is doing well too. I hope it's not a grace period. We've switched schools before and a lot of times there is a calm before a storm. The school arrangement is something new for C1. He's spending part of the day in a regular education fourth grade classroom and part of the day in a resource room. In the previous school district he also spent some time in a regular education room, but the majority of the time was in a self-contained classroom for mildly impaired students. To say that C1 didn't like being in a special education room is a understatement. So I'm hoping and praying that this new arrangement will be a great blessing. In terms of making friends in our new community, both boys have more friends than I do. I haven't really had time to do that yet, though I've met some other nice moms. Next on my to-do list is to find a good pediatrician. With C1's health issues, I am hoping that I can find a good one. I hear it takes about a year to settle into a new location. I moved five times in fifteen years so I believe that is more or less true. So far I'm impressed with how well both boys are adjusting. I'm especially proud of C1. Transitions can be difficult for a person on the autism spectrum and he has done really well with all of the changes. I hope he continues to thrive here, along with C2. My husband likes his new job, although he says it's like catching a new movie halway through and trying to catch up with the story line. It's a notch up on the career ladder for him. He's the associate dean (sort of second in charge) of the academic library for the local campus in our new city. As for me, I'm still a little overwhelmed and am dealing with some homesickness. However, I'm taking in the beauty of the Pacific Northwest and am enjoying living in what I consider my dream home. In time, this new place will feel like home to me. It is Latin and means: Be patient and tough: someday this pain will be useful to you. Yes, this change has been hard, but it's been a worthwhile journey. Everything that has happened to me thus far in my life has made me a stronger better person. That includes raising a child with special needs. The 2 Cs looked adorable in the wedding photo! And congratulations to your niece. So pleased to hear the job, school and everything is working out and the time will soon fly. I like your closing thought! So true! Its great to hear the transition is going well so far. If you ever have time I would love to hear how things are different there as far as the team working with C1. I'm becoming quite fascinated with the differences across states. I hope that Washington is good to you! We are in the process of looking for a job, which we may be moving for. It is hard to decide where to take our son with autism. a great read...and a fascinating look into a way of life I've only experienced by watching Rain Man....a wonderful blog.